These are the other fabrics I painted today. It's late and my pictures aren't taken in the best lighting. They are more vivid than the picture shows. The pink one is going to be used in an applique of pink petunias hopefully. The blue one shows the sun print of the rose leaves. It was an experiment but hopefully I will use parts of it in quilts. The hand of the fabric is so soft, nothing like acrylic paints. I have to order more PFD (prepared for dyeing) fabric so I can paint more! Fabric detail...soon to be pears! Wow! I had fun today! But first let me say, I had a great time in Ohio with my friends. I was there for a week and got to go to the NQA show and took classes at QSDS (Quilt Surface Design Symposium). If you ever want to be inspired in your artwork, sign up to go. While I was there, I noticed a lot of artists dyed their own fabrics. I still want to try this when I get the dyes, but being the impatient person I am, I decided to try something I have not tried before. I used PFD fabric and Setacolor transparent paint. 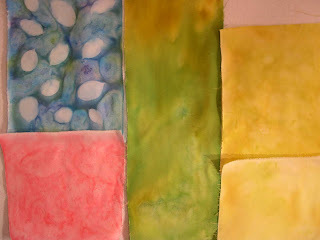 It is so cool to see the designs appear on the fabric when it dries. 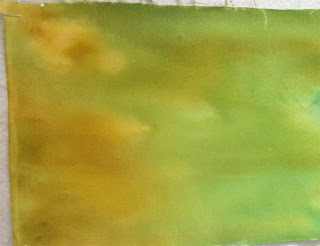 I have 4 pieces drying on the deck at the moment...one is a sun print of rose leaves. First, I laid the fabric pieces on a smooth board (plexi-glass) and used a sponge brush to paint them with water. Then, I diluted the Setacolor (1 part Setacolor to 2 parts water) and used sponge brushes to dab, paint, and swirl it around until I liked the color combination. I then threw on some Kosher salt and set it in the sun to dry. If you want to make sun prints, add a few items such as leaves. Then, when dry, I brushed off the salt and heat set with a hot iron. Then I rinsed it (no colors ran) and let it dry a bit and then ironed again. I see pears! I love pears! (look for a pear quilt soon!) The fabric is so soft! I may decide I like this more than the dyeing process. (No nasty powders to inhale). So, I am off to make dinner and think of other colors I want to use. My class at QSDS was "Color Confidence".